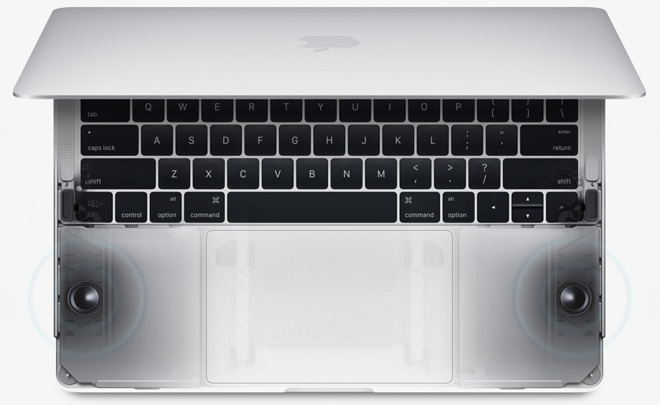 One of Apple's less emphasized upgrades in the 2016 MacBook Pro is better internal speakers, which should —in theory, anyway —be good enough that you might choose them over headphones or external speakers, if just for the sake of convenience. Apple says that it has redesigned the speakers to ensure "maximize air displacement," as well as connect them directly to system power, allowing up to three times more peak power. The net effect is claimed to be up to 58 percent more volume, and bass that's as much as 2.5 times louder. Bass is often one of the weakest aspects of laptop audio, since there's no room for a dedicated subwoofer. Apple is also promising twice the dynamic range, though it hasn't provided any firm numbers in that area. It should, however, expand the highs and lows the speakers can hit without distortion or other issues —another common obstacle with laptops. Apple announced the new MacBook Pro last week at an event at its Cupertino headquarters. Its main feature is the Touch Bar, a multitouch display strip at the top of the keyboard that replaces function keys and adapts automatically to the app being used. While the computer is already on sale, in 13- and 15-inch sizes, U.S. online orders are currently taking 4 to 5 weeks to ship. One exception is the 2016 13" MacBook Pro without Touch Bar, which is now in stock at $1,499.00 with no tax outside NY in both Space Gray and Silver from Apple authorized reseller B&H Photo.